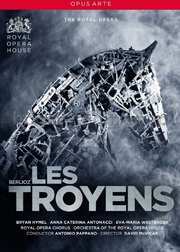 Les Troyens is a tour de force that ranges from fiery military marches to intense choruses, passionate soliloquies and the lyrical love duets of Dido and Aeneas. For Hector Berlioz, librettist and composer, the opera became the work of decades and the passion of a lifetime, the culmination of his literary love affaie with with Virgil's Aeneid and with two tragic heroines, Cassandra and Dido. David McVicar's staging is on an enormous scale, assembling one of the largest casts ever seen at Covent Garden. The sweeping theme of the rise and fall of empires runs throughout the opera along with moving meditations on love and honour. Filmed in High Definition and recorded in true Surround Sound.